The Subaru GD STI comes with pretty good brakes from the factory, big Brembo 4 piston front and 2 piston rear calipers squeeze big vented rotors. In other words the stock brakes are already quite good, what would have been state of the art just a few years ago. This means we would have to be careful when it comes to modding them, it is easy to mess things up and actually do worse than stock with a poorly engineered brake upgrade. So why would we want to change them out with something else? 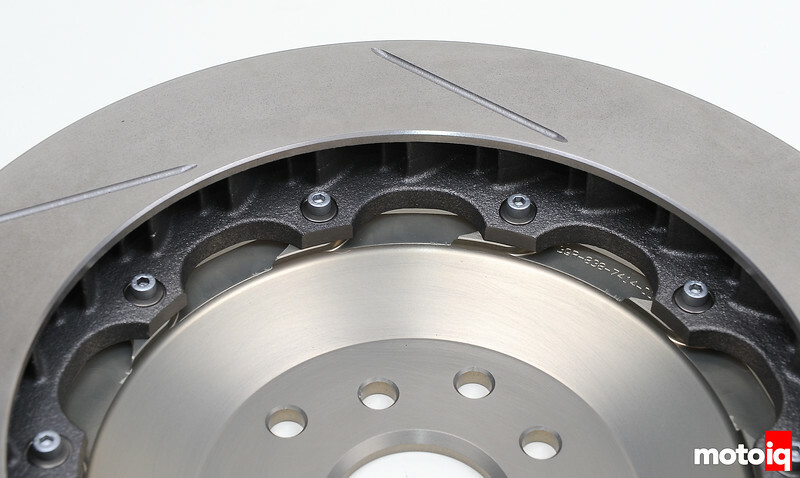 The main reason is that since our car is going to see some occasional track use, we want to upgrade our brakes so we can drive our car to the track for an event without the hassle of having to switch pads at the track. The big brakes will allow us to run at speed on a streetable brake pad. Bigger more powerful brakes will also be easier to modulate. The third reason is admittedly that big brakes just plain look cool! 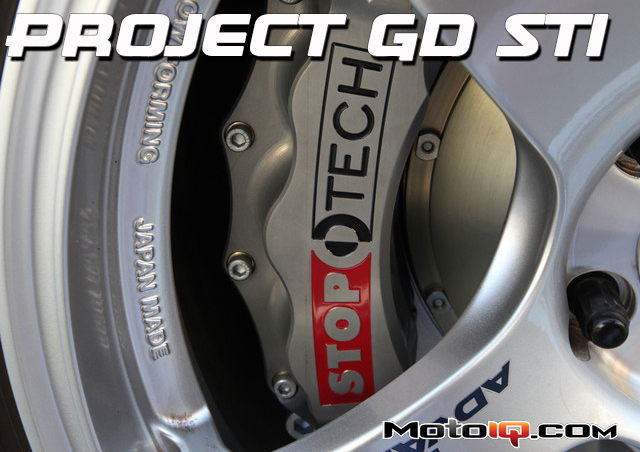 We went with Stoptech as the brake system of choice for their combination of daily driveability and track performance. We selected Stoptech's Trophy STR big brake kit. 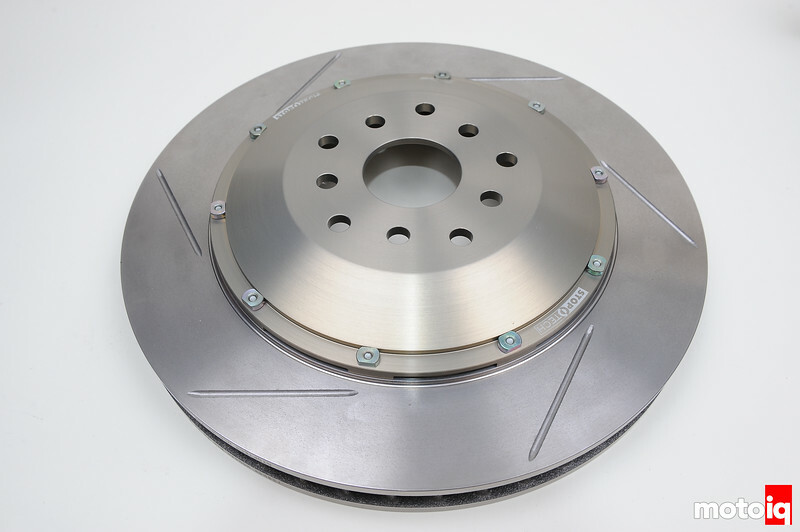 Our Stoptech STR Trophy kit came with a large 14″ or 355mmX 32mm slotted rotor. The hat is hard anodized for corrosion resistance. The rotors have a proprietary low turbulence vane design which greatly improves airflow throughout the rotor for better cooling. The vanes are staggered at the inner diameter entrance for more air intake and are airfoil shaped in profile. In benchmark testing of the Aerorotor, it had the best airflow of any rotor on the market. The Aerorotors are also directional so you don’t have reversed vanes on one side of the car like many other rotors. Better rotor cooling leads to longer life, less fade and greater resistance to warping. The Stoptech hats have vanes in them to pump air between the rotor and the hat to reduce the amount of heat transfer to the wheel hub and bearings, an interesting touch. Stoptech floats the rotors using a special shoulder bolt which allows the rotors to move on the hats even when fully tight. This helps reduce caliper piston knockback and reduce rotor coning when hot. Normaly the rotors are sent fully floating which is better for racing but we had the rotors built with anti rattle washers. 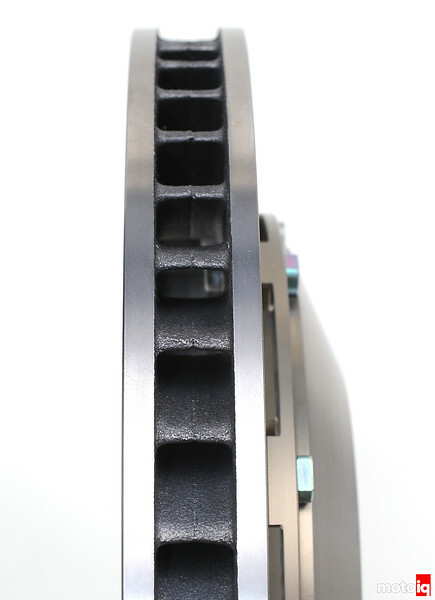 A heat resistant Inconel cone spring washer shown here allows free play but has enough preload to reduce rattling, the fully floating rotor's only real disadvantage. 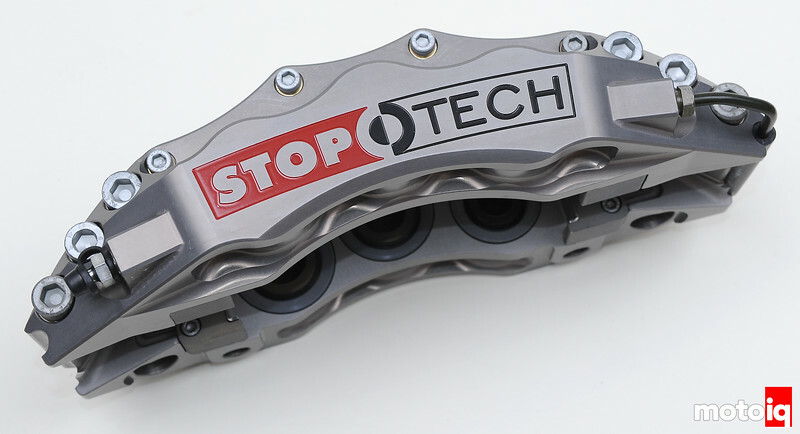 The Trophy kit features an enhanced version of Stoptech's venerable ST-60 six piston caliper. The Trophy calipers feature a forged aluminum alloy body. Forging is a superior method of forming aluminum when an aluminum billet is heated and basically smashed into shape using many tons of force into a die. Forging produces a part with compressive stress for increased strength. It also orients the metal's grain in alignment to the part's shape. Putting the grain in the right direction increases strength and dimensional stability, much like how putting the grain of a piece of wood in the direction of stress makes for a stronger wood part. The pressure and stress of working the metal during forging also refines the aluminum's grain making it finer and eliminating voids and other internal flaws that can weaken the structure. This also makes for a much stronger part.